Me gustan los estudiantes. This painting by Austin's Carlos Lowry is the cover art on the Fall 2013 NACLA Report on the Americas. The elections in Chile take place as the country marks the fortieth anniversary of the bloody military coup that happened with covert U.S. assistance. “[T]he battle over memory is a struggle over meaning…” -- Steven S. Volk, "The Politics of Memory and the Memory of Politics," Fall 2013 NACLA Report on the Americas. On Sunday, November 17, Socialist Michelle Bachelet received 47% of the vote in a field of nine Chilean presidential candidates. She will go into a December 15 run-off with a candidate from the hard right, Evelyn Matthei, who received 25% of the vote. Bachelet will likely serve a second term as president of Chile. Both run-off candidates are daughters of Chilean Air Force officers. Bachelet’s father was an Air Force Brigadier General at the time of the 1973 military coup. Known for his loyalty to the democratic government, he was arrested for treason, tortured, and died in prison. Both Michelle Bachelet and her mother were arrested, tortured, and forced into exile. In stark contrast, Matthei’s father was a key member of the military junta. The memory of military rule for these two women could hardly be more disparate. The elections in Chile take place as the country marks the fortieth anniversary of the bloody military coup that happened with covert U.S. assistance. The September 11, 1973 coup overthrew the elected Socialist president Salvador Allende. The Fall 2013 NACLA Report on the Americas, published by the nonprofit North American Congress on Latin America (NACLA), explores the implications of that coup. The cover art on the NACLA issue is by Austin artist Carlos Lowry. The painting hangs above our couch. It features Camila Vallejo against a background of jubilant students. The painting's name, Me gustan los estudiantes, is taken from a song by the legendary Chilean folksinger Violeta Parra. 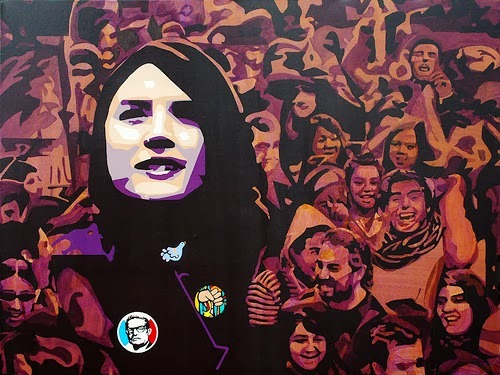 Camila Vallejo, featured on NACLA’s cover, was president of Chile’s largest student federation. She became the well-known face of the 2011 student movement demanding change in an educational system that has left Chilean students among the most indebted in the world. On Sunday, Vallejo was elected to the Chilean Congress. Three other student leaders were also elected. NACLA’s compilation of articles describes Chile 40 years after the coup. To some, Chile became a neoliberal economic success story. "Shock Doctrine" is what Naomi Klein calls it in a book by that name. Democracy was dismantled and social movements demobilized by military force. Opponents were imprisoned, tortured, “disappeared,” and exiled -- displacing and scattering Chileans across the globe. The public sector was weakened, free market tactics were celebrated, and public services were privatized. But NACLA deals with another aspect of Chile’s coup -- the success of an international solidarity movement, the exposure of U.S. complicity in the coup through congressional hearings, the mobilization of many non-governmental organizations (NGOs) to address human rights abuses, the creation of human rights archives (including one at the University of Texas at Austin), and the genesis of Central American solidarity committees. NACLA also examines the Chilean student uprising, and contrasts it with Wall Street occupiers and Spain’s indignados. The student movement of Camila Vallejo claimed new space for social movements, and defied the status quo of Chile’s neoliberal economy. Student leaders rejected “politics as usual” as practiced by the dominant coalitions since 1990. The student demand for tax reform sufficient to support free education will become a major challenge from the left for Michelle Bachelet when she takes office again. The bold student demonstrations, complete with theater, took politics into the streets in ways not seen for decades. Students staged an 1,800-second long "kiss-in" for education and an 1,800-hour-long relay around the presidential palace. The "1,800" symbolized the investment (2.2% percent of Chile’s gross domestic product) required to fully fund public education. Chile is a territory of contradictions. They are as vast as its geographic extremes -- Andes to ocean, desert to rainforest. It is a country in which neoliberal policies deformed public education, weakened national health care, and caused students to incur burdensome loans. Its new prosperity rests upon severe income disparity. It is a country that U.S. Republicans have sought to emulate in plans to “privatize” Social Security. Yet, it is a country whose recent student mobilizations have inspired students around the globe. It is a country that just elected Camila Vallejo, a Communist, to office, and is poised to elect Michelle Bachelet, a Socialist, to a second term as president.